Okay, we’ve got good news and bad news. 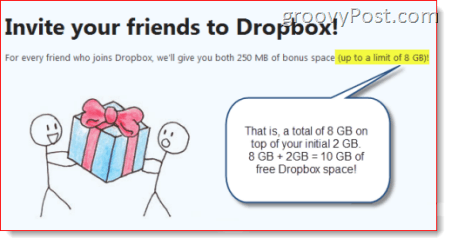 The bad news: MrGroove made a mistaken assumption with our earlier post on How-to Get an Additional “6” Gigs of Free Dropbox Space. 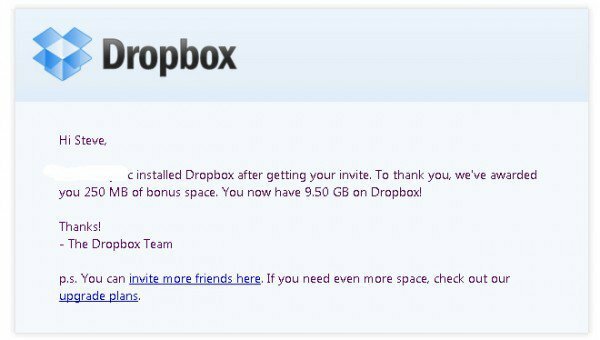 The good news: You can actually get an additional 8 gigs of free Dropbox space!! Proof? Thanks to all you groovyReaders who accepted MrGroove’s invitation to give Dropbox a try, he has now busted through the presumed 8 gig ceiling and is skyrocketing his merry way towards 10 gigs! As of now, MrGroove has 9.5 gigs of Dropbox space on his free 2 Gig “Basic” Dropbox account. And you can have it, too. Simply log in to your Dropbox account and click the Get Started tab and follow the six easy steps to begin building on your free 2 Gig account. Oh, and when you get to the sixth step and they say: “For every friend who joins Dropbox, we’ll give you both 250 MB of bonus space (up to a limit of 8 GB)!” they mean you can receive an additional 8 gigs, rather than 8 gigs being the limit of your total Dropbox space on your free account! So, just to be extra clear, you get 2 free gigs of Dropbox space when you first sign up for your basic account. Then, you get 250 MB of free Dropbox space when you complete the Dropbox tour. Then, you get an additional 250 MB of free Dropbox space for each referral (they have to click your referral link and install Dropbox) with a limit of 8 gigs of additional Dropbox space from referrals and 10 gigs TOTAL. So it may even be possible for you to get slightly more than 10 gigs of free Dropbox space. But at any rate, you can most definitely get more than 8 gigs of Dropbox space without springing for that $99.00/year Pro account. Very groovy! can you people please use my link? Exactly Robert! Use my link now! I allready got Dropbox installed. So, did you hit 10 gigs yet? aye – I had 10.25 GB shortly after this article. How you doing so far? Nice Phil. How did you do it? Did you refer all your friends and fam or did you just post it around the blogsphere?